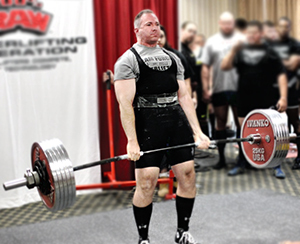 Tim has been competing in powerlifting for over 20 years. He was a collegiate All American Powerlifter with the USAPL and he has set several Open Federation Records with 100% RAW and the AAU. He currently coaches Team Force, his powerlifting team, which won the Open Federation Team Championships in 2011 and 2013. In 2003 he deadlifted 700 lbs at 198, setting the VA State Record for the deadlift. He has also competed in strongman and arm-wrestling competitions. He is lifetime drug free.